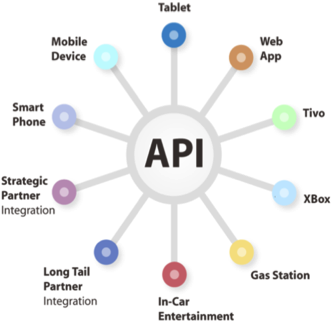 SAP NetWeaver Gateway provides an API that is designed to function in just such a manner; and it does so using Microsoft’s open and license free standard called OData. Consumption of data through the SAP NetWeaver Gateway interface requires nothing more than the ability to make an HTTP request (something any browser can do); in other words, it does not require the use of any SAP proprietary software or protocols. Although it is perfectly legitimate to do so, the consumption of data through the SAP NetWeaver Gateway interface does not impose any requirement on the developer to be able to write software in ABAP, or even to have any understanding of the internal workings of an SAP system. Using nothing more than commonly available development tools such as Microsoft’s .Net or Apple’s XCode, or Open Source languages such as Ruby or PHP, you can easily create user interfaces for SAP business data and functionality by consuming the OData messages coming out of SAP NetWeaver Gateway. In order to make the OData consumption process even easier, SAP deliver a Gateway Consumption Tool. This tool currently supports either Visual Studio 2010 or XCode and can be used to generate either an OData proxy object, or a basic application that wraps the generated proxy object. As can be seen from the diagram on the right, Microsoft’s OData protocol is based on the Atom Publishing Protocol which in turn, is based on the Atom Syndication Format. SAP has used the standard extensibility features found in OData to provide its own annotations. The combination of OData’s data format and the SAP Annotations make SAP business information both self-describing and human readable. These two factors alone lower the barrier for consuming SAP business data and functionality to the point that no specialist knowledge of an SAP system is required before such data can be incorporated into a useful business application running on some external device. The SAP NetWeaver Gateway interface has been designed to conform completely to the six architectural constraints that define a RESTful software system. This makes the business data content of your SAP systems accessible as RESTful resources through a uniform, stateless interface to any software system that can communicate using HTTP and the OData protocol. So is SAP NetWeaver Gateway Just For Mobile Devices? It is easy to think of an “external device” as being simply some type of hand-held, mobile device; but while that idea is perfectly valid and may well be of great significance to you, it’s only one of several possibilities. Mobile devices using native applications E.G. the iPad/iPhone or Android or Blackberry. Embedded devices such as manufacturing robots or route planning software in Satellite Navigation systems. OData becomes the only communication protocol needed for you to supply or consume SAP Business Data to or from your SAP systems. Different types and versions of SAP systems now appear as a single, integrated repository of business information. Does SAP NetWeaver Gateway Replace any Existing SAP Software? In a word — No. SAP NetWeaver Gateway is not designed to be a channel for the type of transactional applications used by Power Users, neither is it designed to replace existing middleware like SAP NetWeaver PI. In addition to this, SAP NetWeaver Gateway applications are not designed to target A2A or B2B scenarios. Instead, SAP NetWeaver Gateway is the door through which the mass consumption of SAP business data and functionality is made possible. 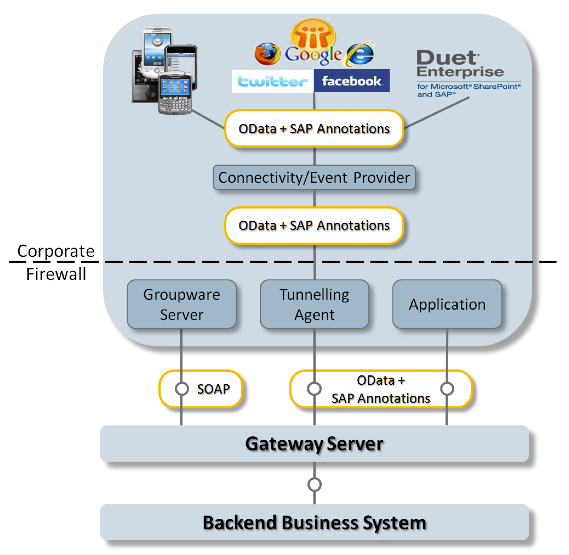 The target audience for SAP NetWeaver Gateway applications is a group known as Occasional Platform Users (OPU). These are people who need ad hoc access to SAP data and functionality in an easy-to-consume manner. As part of the SAP NetWeaver Gateway software, you get various Service Provisioning tools. These tools will generate the necessary source code to jump-start the development of your external business applications. These tools can be used in conjunction with widely used Integrated Development Environments (IDEs) such Eclipse, Visual Studio 2010 and XCode. 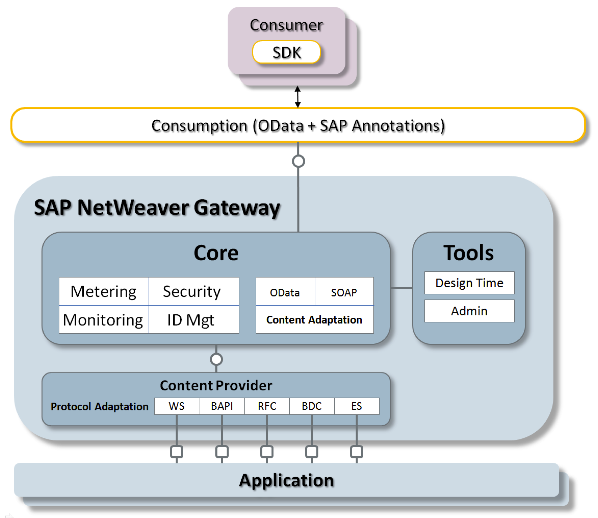 Not wanting to leave out all the die-hard ABAPers out there, the SAP NetWeaver Gateway Add-On provides you with the OData Channel. This is a set of ABAP classes and interfaces that can be used to develop your own Gateway Model Objects within your backend SAP system. These are then registered with your SAP NetWeaver Gateway system in order to make them accessible to the outside world as RESTful services. What Impact will the Gateway Software have on my System? Either way, since the installation of SAP NetWeaver Gateway is provided through the ABAP Add-On process, it will not interfere with the functionality of your existing system. REST-enables your SAP system, thereby lowering the data consumption barrier to the point that no specialist knowledge of an SAP system is required before SAP business data can be consumed. Will hide all the technical complexities of your SAP system landscape behind a single interface that is easy-to-use and non-proprietary. Makes your SAP business data and functionality accessible to any external device or system that can speak HTTP and understand the OData protocol. Provides Service Provisioning tools that allow the quick REST-enablement of existing ABAP functionality. Provides plug-ins for well known IDEs such as Eclipse, Visual Studio 2010 and XCode. Is installed as an ABAP Add-On; therefore, it will not interfere with your existing productive software. ABAP code demonstrates how to create an internal table structure dynamically from within your SAP code. The program takes a table name as its input and then builds an internal table dynamically from this information, it then populates it with data and displays it using an ALV grid control. parameters: p_table(30) type c default 'SFLIGHT'. * Return structure of the table. ref_table_descr ?= cl_abap_typedescr=>describe_by_name( p_table ). loop at it_tabdescr into wa_tabdescr. create data dyn_line like line of <fs_table>. Analyzing Possible Metrics to Define "Large Systems"
A bonus buy defines the set of item(s) for which a discount type can be granted when certain requirements are met. Fixed price, fixed discount, percentage discount or free goods discount are possible for bonus buy conditions. This use case describes the transfer of bonus buy definitions from the ERP system to the SAP (GM) POS system using the POS integration content. Where the z item can be a single article or an article grouping. The w item can be a single article or an article grouping or identical to the z item. This depends on the bonus buy definition. In older versions of SAP (GM) POS, the inclusion/exclusion functionality does not exist. In this case, the set of z and w items are identical. Also, the retail price of the z items must be greater than or equal to the retail price of w items in order for the discount of the bonus buy to be applied. bonus buys in the ERP system are referred to as mix matches in the POS system. inclusion/exclusion is available in SAP (GM) POS version 2.1 or higher. The XI system must be configured to ensure the connectivity in the communication with the ERP system and the SAP (GM) POS system. Sites (or stores) master data must be defined in the ERP system. Article master data must be defined for a specific store or set of store(s) in the ERP system. All required customization for bonus buy functionality must be completed in the ERP system. For example, the condition types for each discount type must exist in the ERP system. If the retailer deletes one or more bonus buy(s), refer to Use Case: Deletion of Bonus Buy Promotions. The retailer creates and/or modifies one or several bonus buys for a set of items for a specific store or group of stores in the ERP system using the transactions VBK1and VBK2, respectively. Note that the bonus buys must be defined as described in the Configuration Guide in order for the integration to work as designed. The retailer performs a download of the bonus buy data in the ERP system to one or more stores with transaction WPMA. The bonus buys are transferred through the ERP Bonus Buy Conditions IDoc. Once the ERP system generates the Bonus Buy Conditions IDoc, the XI system processes the bonus buy information through a two-step mapping. When the conversion is complete in the XI system, the generated input files are transferred to the SAP (GM) POS system, where the mix match and inclusion/exclusion data is stored in the POS database. If a cashier at a given store tries to scan (or enter) the bar code number(s) of one or more articles that have been assigned to a mix match and the prerequisites are met, the mix match description and discount are displayed at the register. The IDoc WPDBBY01 is used for the download of bonus buy promotions. This field specifies the document number of the IDoc. Each segment represents a bonus buy condition. Store for which the bonus buy is applicable. Specifies the action performed on the bonus buy information. Each segment defines the items that can receive the discount once the bonus buy conditions are reached. Note that this information is required when using the inclusion/exclusion functionality available in SAP (GM) POS 2.0. The international article number (EAN/UPC) for the "Get" article. Note that the bonus buy is referenced through the EAN of an article. Each segment defines the items that can be purchased for the bonus buy to be applied. The international article number (EAN/UPC) for the "Buy" article. Note that the bonus buy is referenced through the EAN of an article. Each segment represents the terms of the discount/condition for the bonus buy. Date when the bonus buy starts. Date when the bonus buy ends. Specifies the type of discount or condition. This segment defines the conditions and pricing terms for the discount. Specifies the calculation type for determining free goods quantity. Description of the bonus buy. Identifies the language used for requested and provided descriptions. Indicates the minimum number of items to purchase. Total number of items to be purchased in the bonus buy. Indicates the number of free items granted. Specifies the condition target type for the bonus buy. For this scenario, the value 'M' indicates article. Indicates if there is a negative or positive adjustment to the price. Specifies the percentage amount for the discount. Specifies the percentage amount for discount. Specifies the condition target type for the bonus buy. For this scenario, the value 'R' indicates total sale. Specifies the actual amount in a particular currency for the discount. Specifies the currency key for the amount in the case of absolute markdowns. Specifies the actual price in a particular currency for the item(s). Specifies the condition target type for the bonus buy. For this scenario, the value 'G' indicates article grouping. Specifies the currency key for the price amount. Specifies the condition target type for the bonus buy. For this scenario, the value 'R' indicates total purchase. Note that in this case, the purchase of item 2050000006401 or 2050000006432 grants the discount. This case is similar to "Buy 1 get 1 free". The Item Maintenance message is used to list the articles with their associated bonus buys. The Price message is used to define the bonus buy conditions. Specifies the identity of the message. Note that this element is not used in SAP (GM) POS. Store for which the bonus buys are applicable. Specifies the type of business unit. The default value is 'RetailStore'. Note that this attribute is available but not used in the integration. Each node represents an article. Specifies the action performed on the article information. The international article number (EAN/UPC) for the article to which the bonus buy applies. Some details about the article specified in the bonus buy. Note that the possible values are 'BuyArticle' or 'GetArticle'. Specifies the type of article identity listed for the bonus buy. The default value is 'PLU'. Note that this attribute is available but not used in the integration. The bonus buy number. Note that there can be multiple instances of this element if several bonus buys apply to an article. Specifies the trigger for the Price Message. In this scenario, the Bonus Buy IDoc is used to create the Price message. Note that this attribute is available but not used in the integration. Specifies the action performed on the bonus buy. Note that this attribute is available but not used in the integration. Each node represents the terms of the discount/condition of the bonus buy. Indicates the number of items for which the discount is applied. The international article number (EAN/UPC) for the articles that must be purchased for the bonus buy to be applied. Derviation node Each node represents the price conditions of the bonus buy. NewPrice Specifies the actual price in a particular currency for the article in the case of new price discount. Specifies the currency key for the amount in the case of new price discount. Provides a detailed description of how a price is derived. Indicates who will be granted the price change. The default value is 'Customer'. Note that this attribute is available but not used in the integration. Specifies whether the price change is due to a markup or markdown. The default value is 'Down' since the scenarios used are markdowns with the exception of new price on total sale scenario. Note that this attribute is available but not used in the integration. Derivation-> ItemID The international article number (EAN/UPC) for the articles that are received as part of the discount once the bonus buy is granted. Note that the MajorVersion, MinorVersion, and FixVersion specify the revision of the IXRetail Price message used in the integration. These files are often referred to as PLUTXN, MIXMATCH and DISCINEX, respectively. The extension of these files is .asc (ASCII). With each download, a trigger file is also created to indicate to SAP (GM) POS that an update to the database is necessary. When new mix match data is downloaded, the old records are overwritten. On the other hand, if new article data is downloaded before the previous changes are applied, the new article records are appended to the previous flat files. The same logic for article records is applicable for the inclusion/exclusion records. The bonus buy numbers in the ERP system are listed as numeric values in this file since they are transformed via a value mapping. For more information, refer to Section 9. Note that additional records will be downloaded when using inclusion/exclusion functionality of SAP (GM) POS 2.0. Refer to the previous Section "Translation of IXRetail Item Maintenance Message of Store 0000009901 into PLUTXN flat file" for more details on these records. Directory where the source file must be stored in the POS system. Note that the directory name corresponds to the store number. Each segment represents an article. The international article number (EAN/UPC) for an article. The mix match number for which the article is eligible for. Additional mix match numbers for which the article is eligible for. Note that a maximum of four mix matches can be assigned to an article at one time. Note that the <Header> data is extracted to determine the directory and name of the file to be created in the POS system, and is not part of the flat file. Note that the length of the description for the mix match is restricted to 20 characters. Therefore, the description will be truncated in the output as it appears in the sample above. To differentiate total sale and article level promotions, the tags [TOTAL] and [ITEM] are used for illustration purposes only. Each segment represents a mix match or price rule. Description of the mix match. Indicates the number of items for which the mix match is granted. Date when the mix match starts. Date when the mix match ends. Note that an end date with year '9999' from the ERP is not supported by the POS. If this is the case, no date is specified. Specifies whether the discount is prorated or not. Indicates that the prerequisites of the mix match must be completely satisfied. This field indicates that promotions and discounts are to be re-calculated after a mix match is applied. AtTotal This field indicates that the mix match must be applied at the end of the transaction. Note that the default value is 'Y' when using Inclusion/Exclusion functionality. Otherwise, the value is dependent on the mix match scenario as specified in the examples. DiscOnLowerPrice This field indicates that the discount is applied on the lowest price article from a set of different priced articles. Note that the value is dependent on the mix match scenario as specified in the examples. GlobalIncluExcluID Identifier for the set of items to be used in a mix-match for a Merchandise Type mix match. Identifier for the list of items to be included or excluded from being purchased for a given mix match. 1) this field is available in the interface of SAP (GM) POS 2.0 release. It is used for Inclusion/Exclusion. 2) this field is not populated if the discount is granted on the total purchase OR if the 'Buy' and 'Get' set of articles are identical. Identifier for the list of items to be included or excluded from being received when a mix match is granted. Indicates that item discounts must be re-calculated if a mix match is applied. Note that this field is available in the interface of SAP (GM) POS 2.0 release. Indicates that the mixmatches are applicable to certain target groups. Specifies the percentage amount for the discount to be applied to the number of items specified in Alt2Qty field. For this case, the percentage is 100 since the article(s) are free. This field indicates that the mix match must be applied at the end of the transaction. This field indicates that the discount is applied on the lowest price article from a set of different priced articles. Specifies the percentage amount for the discount to be applied to the number of items specified in Alt2Qty field. Normally, this element indicates the minimum number of items to purchase. For this scenario, it indicates the total number of items to be purchased for the mix match condition to be granted. Specifies the percentage amount for the discount to be applied to the number of items specified in Alt1Qty field. Specifies the actual amount in the appropriate currency for the discount to be applied to the number of items specified in Alt2Qty field. Specifies the actual amount in the appropriate currency for the discount to be applied to the total sale. Indicates that the prerequisites of the mix match must be completely satisfied. This differentiates it from the previous mix match on an item level. Specifies whether the discount is prorated or not. For the total sale, it is prorated. Specifies the actual price in the appropriate currency for the discounted item(s). Specifies the actual price in the appropriate currency for the total purchase. Specifies the percentage amount for the discount to be applied to the number of items specified in Alt2Qty field. For this case, the percentage is 100 since the gift is free. The discount inclusion and exclusion file lists the sets of articles (using the international article number as a reference) that are purchased or received for each defined mix match. Note that the length of the description for the inclusion/exclusion record is restricted to 20 characters. Specifies the action performed on the inclusion or exclusion record. The store for which the discount inclusion and/or exclusion record is applicable. The identifier for the inclusion and/or exclusion record. Note that there are 2 identifiers: one for the 'Buy' articles and another for the 'Get' articles per mix match. No identifiers are needed if the discount is granted on the total purchase OR if the 'Buy' and 'Get' set of articles are identical. This number determines the order that the rules are executed in the inclusion/exclusion record. Specifies the description for the inclusion/exclusion record. Indicates that the information is for inclusion or exclusion. Note that the default value is 'Include' except for the last rule that is an 'Exclude' of all other articles. AllFlag Indicates that the exact match for the articles is required. Note that the default value is 'N' except for the last rule that is an exclusion of all other articles. In this transformation step, two (2) IXRetail messages are created. If E1WPBB04-> MAT_EAN is available, the default value is 'BuyArticle'. This value is derived based on the bonus buy scenario. This value is derived for the "get free item" or "get free gift" bonus buy scenario. The SAP (GM) POS system supports only numeric values for the bonus buy number whereas the ERP supports alphanumeric strings. Value mappings exist to address this incompatibility issue. For example, bonus buy GMBB1FREE from the ERP can be converted to mix match number 24 via the value mapping. For the inclusion/exclusion file, the identifiers are derived from the bonus buy number so the bonus buy identifier must be numeric. The value mapping for bonus buy number conversion is also used in the instance. It is already possible today to define number ranges for bonus buy IDs in ERP and use it in the desired manner at the POS, e.g. restrict BBY IDs to 1 to 255. In these number ranges are used, no value mapping is required. Item(s) with ItemID->@Qualifer='BuyArticle' AND ItemID->@Qualifier='GetArticle' when using Inclusion/Exclusion.